Whether youve recently give your car a new look with a fresh coat of paint or youve just bought a car, its likely that you want to do everything in your power to keep your cars paint job looking good for years to come. While a garage may be the best solution, this may not be an option due to a lack of space or another car taking up room in the garage. If youre relying on a canopy to keep the sunlight off of your car when its parked at home, you will need to someday take advantage of canopy top replacements. One of the most enticing reasons to rely on a canopy top to protect your car is the variety of sizes that are available. In fact, you should be able to find a canopy top that is large enough to fit your entire car, or even another one if needed. Allowing your cars paint finish to fade may seem like only a cosmetic issue, but it can often lead to other preventable problems. The biggest example of this is the paint being worn done to the point where raw metal is exposed. The reason this should be avoided is due to rusting that can begin to occur. A good reason to never allow your canopy top to stand with holes and other wear and tear is the gaps that could lead to problems with your car. 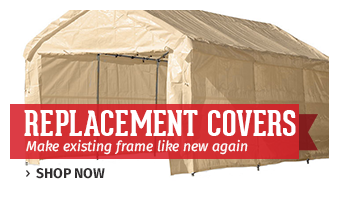 Since a canopy replacement top should be fairly cheap, theres no excuse for letting it deteriorate. As you look into how canopies can protect your cars paint job, feel free to contact us to learn more about what we offer. 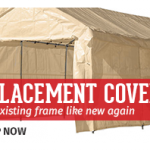 This entry was posted in canopy covers, canopy replacement covers and tagged canopy replacement covers on August 3, 2016 by Canopies Tarps.